Cosequin Review - Is It Right For Your Dog? For many users Cosequin does seem to be an effective nutritional supplement for dogs that eases dog’s joint pain. An increase in mobility is noted by many dog owners after giving this product to their dog owners. Glucosamine and Chondroitin are the two main ingredients that help strengthen your dog’s cartilage and joints. Cosequin is available in multiple forms, depending on your dog’s needs and Cosequin’s website offers a quick survey to help you determine the best Cosequin product for you dog. Available in multiple dosage forms for large and small dogs. While Cosequin is the #1 Veternarian recommended product for joint help for dogs, it’s not guaranteed all dogs will show improvement after taking this product. 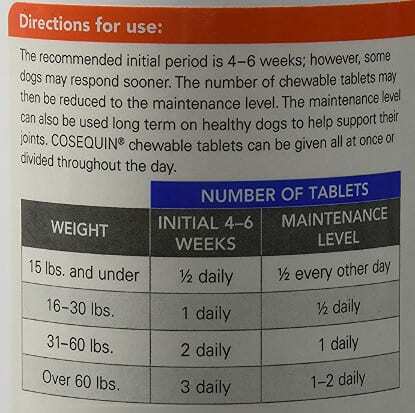 Cosequin appears to be a quality product that can and does improve joint health in most dogs that use this product. Many owners are very happy with the youthful, playful behaviors they begin to see again in their dogs after using it. Side effects are minimal, but various forms of stomach irritation have been noted by some pet owners. There are a diverse number of products available that also to claim help ease dog’s joint pain, but Cosequin is the #1 rated brand recommended by Veterinarians and dog owners who use this product seem to agree that it is the number one choice for their dogs. As dog owners we never want to see our dogs start to slow down or begin to move more slowly than they did when we first brought them into our lives, but unfortunately as dogs’ age, we begin to see the signs. In today’s times, there are many products on the market that promise to help alleviate joint pain, most often the cause of limited movement in dogs, and Cosequin is one of the most popular. The following review provides the information we need as concerned Dog Mom and Dads to decide if Cosequin is the right product for our dogs. Cosequin is a nutritional supplement. Two of the most active ingredients in Cosequin include glucosamine and chondroitin, both known to support joint health in dogs. Cosequin is said to stimulate new cartilage growth, and to protect against the breakdown of existing cartilage. The main ingredient in Cosequin that aids joint health is Glucosamine. Glucosamine is a natural source that already exists in healthy cartilage. Its use in Cosequin helps build up more molecules to support, and create, new molecules within the existing cartilage, therefore strengthening your dog’s joints. This new healthy cartilage supports the dog joints during walking, playing, and jumping. A greater in-depth look into the science of how Cosequin works can be found here. Cosequin, in many dogs, improves mobility and dogs are noticeably more active after taking Cosequin according to many dog owners. Cosequin is the #1 Rated Product by Veternarians for Joint Health. There are fewer side effects noted with the use of Cosequin than some prescription strength joint medicines. Blood Thinning-Chrondroitin, one of the active Cosequin ingredients, is known to have blood-thinning properties. Allergic Reactions-These are rare, but if your dog has had an allergy to products containing Glucosamine or Chondroitin in the past, this product may not be the best choice for your pet. Many dogs experience improved mobility after taking Cosequin. Manufactured under strict guidelines so you can feel good about the quality of product you’re giving to your dog. #1 rated product by veterinarians. Cosequin is not 100% guaranteed to improve joint mobility in all dogs. Side effects may occur with use. Can be costly to administer and the price can increase depending on the type and amount of Cosequin you purchase for your dog’s needs and size. Cosequin DS plus MSM dog capsule ingredients include 600mg of Glucosamine, 300mg of Sodium Chondroitin Sulfate, 250mg MSM and 3mg of Manganese. That is for the DS plus MSM version. The other versions of Cosequin have different amounts of the ingredients. 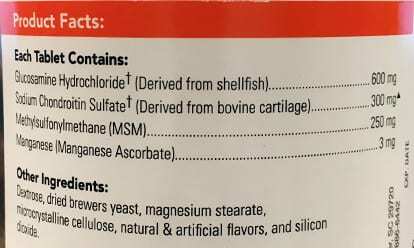 Feel free to check out the Nutramax website to find the ingredient list for specialty versions. For dogs less than 15 lbs: 1/2 tablet once a day for first 4-6 weeks. After 6 weeks, dose can be reduced to 1/2 tablet every other day. 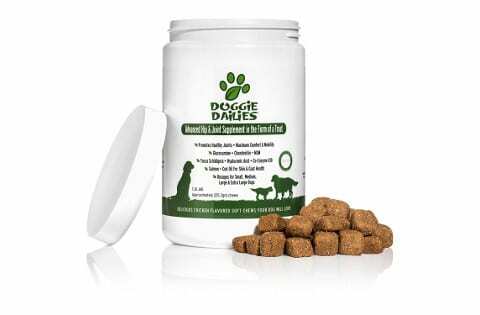 For dogs 16-30 lbs: 1 tablet daily for first 4-6 weeks. After 6 weeks, dose can be reduced to 1/2 tablet daily. For dogs 31-60 lbs: 2 tablets daily for first 4-6 weeks. After 6 weeks, dose can be reduced to 1 tablet daily. For dogs over 60 lbs: 3 tablets daily for first 4-6 weeks. After 6 weeks, dose can be reduced to 1-2 tablets daily. Many pet parents have seen vast improvement in their dogs' mobility and pain levels after using Cosequin. There has also been reports about dog owners beginning to see the "puppy" reappear in their older dogs when they are on Cosequin. Many dog owners have been able to avoid expensive surgeries with long recovery times by obtaining a second veterinary opinion and a Vet has suggested using Cosequin. While those are some glowing examples of Cosequin customers that isn't the whole picture. Some customers have not seen a vast improvement in their dog's mobility. Some owners also cited that they had trouble getting their picky eaters to eat the chewable tablets. Last but not least, some owners have stated that the increasing cost of the product as a negative. Dasuquin is considered the next level joint supplement for dogs by Nutramax (the same makers of Cosequin). It's available in dosages for large dogs (over 60 lbs.) and small/medium sized dogs (<60 lbs.). It also contains glucosamine and chondroitin, as well as avocado and soybean components fortified with green tea. Dasuquin is said to be the most complete joint support offered for dogs (that doesn’t require a prescription). Many of the dog parents that chose this product saw a remarkable improvement in their dogs in a very short amount of time. The added ingredients of avocado, soybean, and green tea also appeal to many owners who like the “natural” additive ingredients of this product. This may be a good choice for dog owners who have tried Cosequin and didn’t see the results they were hoping for, with the added benefit that many of the added ingredients are naturally derived. If you would like to know more then check out our Dasuquin review. Doggie Dailies is an all-natural hip and joint supplement to ease joint problems in dogs and supports healthy joints, ligaments, and cartilage. It includes 6 active ingredients: glucosamine, chondroitin, MSM ( a powerful anti-inflammatory), hyaluronic acid (helps increase joint fluid and cushioning), Coenzyme Q-10 (increases natural energy levels), Yucca Schidigera (anti-inflammatory and anti-arthritic effects). This may be the choice for dog owners who want an all-natural choice to improve their dog’s joint health. Many pet parents are pleased with the results of this product and this may be a good choice for those looking for a less expensive alternative to Cosequin. This is a liquid supplement that because of its all-natural Omega-3 and Omega-6 fatty acids improves joint health and is made for use by both dogs and cats. This product also contains ingredients that improves not only joint health, but also offers skin, heart and immune support. This product may be a good choice for dog parents looking to add a supplement to their dog’s diet that is focused on more than just joint health, such as improving skin condition and immune health. This also may be a good choice for dog owners that have picky eaters that won’t eat supplements in a pill or treat form. This Cosequin review is meant to help dog owners discover more information about Cosequin and to help decide if Cosequin, or one of the many alternatives, may be a good choice for your dog. As always before adding any supplement to your dog’s diet it is a good idea to check in with your veterinarian, who knows your dog’s health history best, to help decide if this product may be right for you and your dog. If you think Cosequin may be the best option for you and your dog, click the Check Price button above.